I've finally managed to finish my Knight for the Santa Cruz Warhammer Knights of Bal Timorea Project. I have to admit, this guy was a ton of fun to paint. It was such a huge departure from painting space marines, that parts of it became a real challenge. I started this one not really knowing what colors or iconography I was going to use and sort of made it up as I went along. I kept the overall look dark and then used the icons to add some contrast to the model. When I first asked them, my Wife and Daughter said the horse needed to be brown with white hooves in the back. So I painted the horse brown. 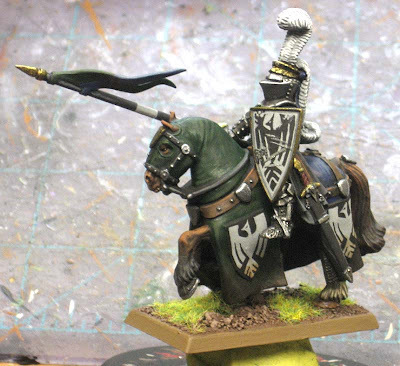 When they saw my paintjob and the rest of the model, they told me the tail was painted wrong (apparently it must be black on a brown horse) and that the horse should be all white now. Not possible I told them. Then I claimed artistic license with the tail color and left the room. I don't think they understand that I can't just keep changing the horse color until I find something that "works." I wasn't going to explain it either. Maybe next time I can change it I told them and they seemed happy with that. I tried to make his base look "muddy" and used some darker browns on it with the static grass. I didn't get super fancy or anything, I just limited the colors I used on it and didn't put too bright of a highlight on the base. All in all, I consider this guy a success. Painted to a tabletop standard, a little bit of weathering and some freehand all come together to make what looks like a regular Knight to me. Of course this is my first real "Fantasy" model so there's lots of room for improvement here. While you've done a fantastic job on the paint job, I'm going to side with the women-folk in that you've chosen the wrong color scheme for the pony--not that I agree with them per se--I've just learned that it's usually in my best interest to side with them. This guy looks good. I can't wait to see a group shot of all our knights together. Rob: Thanks, but I'm still removing you from my friend list and never showing this comment to my Wife. 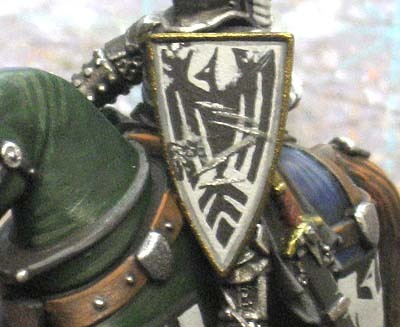 Looks like you got a little inspiration from either the Raven Guard models you have converted/painted with the iconography on the horse and shield. I also side with the women. Sorry Ron, got to look out for numero uno. Every man for himself. 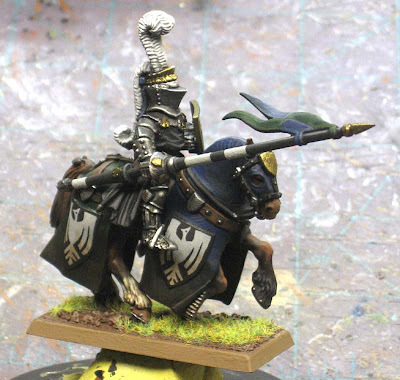 Impressive, looks really good; the heraldic motifs well, i suppose that painting raven guard betrayed your mind designing the ones for the knight, but tie well with the miniature. Finally, I like the color choice for the horse, it looks right to me. Looks great, Ron. I really like the heraldry and especially how you reversed the colors on the shield. Nice battle damage there as well. It will be cool to see all of our entries pictured together. even if it were wrong somehow,(which it's not)I don't think lizardmen, orcs and Ogres will mind. He looks amazing, I can't wait to see all of our Knights together in one shot! Beautiful paint job. The battle scars on the shield are a fantastic touch. I'm sure once SC John gets all of the Knights, he snap some pics and post them for all of us to see. For all of you that sided with my Wife, I'm hurt. For the rest of you that sided with me, thank you. And yes, I completely used the Raven Guard symbol on this guy. I had no idea what to paint and I've been painting so many of those recently that I figured I would just keep going with it. I have him in my grubby hands and he looks way better in person. SC John: For some reason, it's like that. I post pics here and the real thing almost always looks much better.